Even though we’ve technically moved all of our stuff to the new house, there are still some major not-so-settled aspects to our life right now. The first big thing keeping us firmly planted in the “land of unsettled” is that we don’t have a kitchen (though, the granite guy is coming to measure today, which inches us to the edge of finishing-up). The second thing that reminds us that we are not-quite-moved-in is that at least half of our belongings are still packed in boxes in the garage (a function of still having several major unfinished spaces). With that in mind, I’ve given up on finding most of my Christmas stuff (though, I know where a few boxes of ornaments and the Advent Ornaments are and figure that’ll do for decor this year). The things I can’t bear to do without, I’m remaking (or buying). 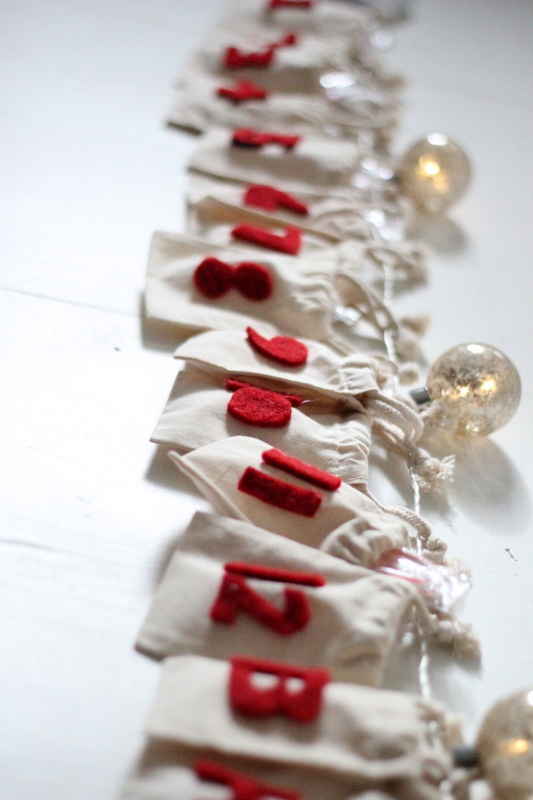 An advent calendar and our December List are on my must-do list. 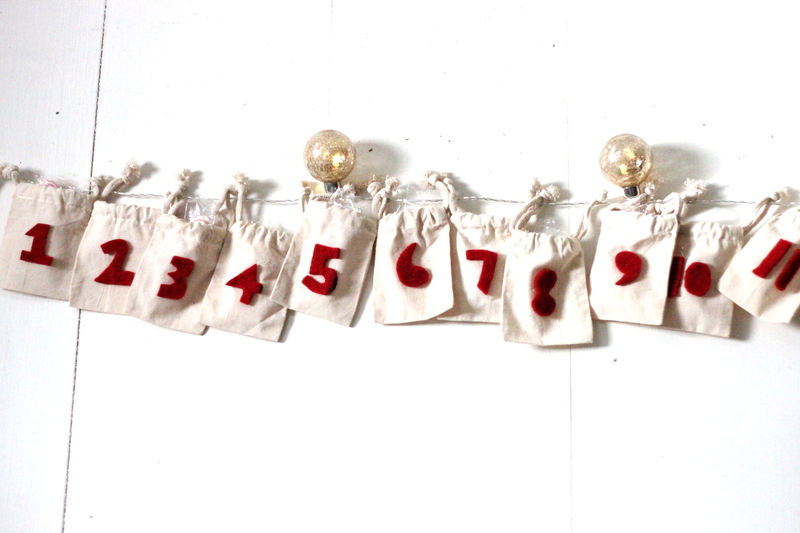 Since I had a pile of plain muslin bags leftover from Adam’s grad party (I originally ordered them from Papersource, I think), Burke and I put together a makeshift advent calendar this weekend (I cut the numbers out of felted wool and then we glued them onto the muslin bags). And we love it. It is super simple- just a couple of mini candy canes and little mini December List activities for each day. A quick note about balance– our mom did a fantastic job of making the holiday season magical and brimming with traditions. I really want to give my kids that same kind of Christmas season. At the same time, a calendar that is too full or packed with obligations is overwhelming and makes for grouchy kids (and parents!). 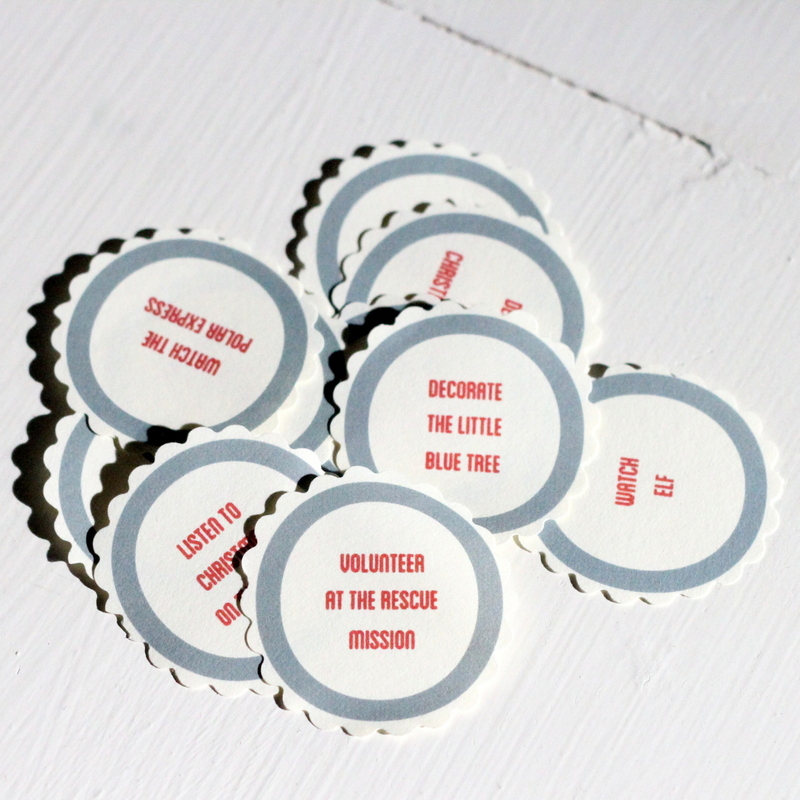 I try to build into the list all of the things that we’ve committed to (my mother-in-law’s cookie exchange and volunteering at the Rescue Mission, for example). I also try to add a generous dose of ‘low maintenance’ things (eat a candy cane, listen to Christmas on the Beach, etc.). And finally, I try to add in a few activities that we do around here anyway (visit a new park, family game night). That way, the fabulous part of having traditions is not overshadowed by a frantic schedule (or a frantic mama). 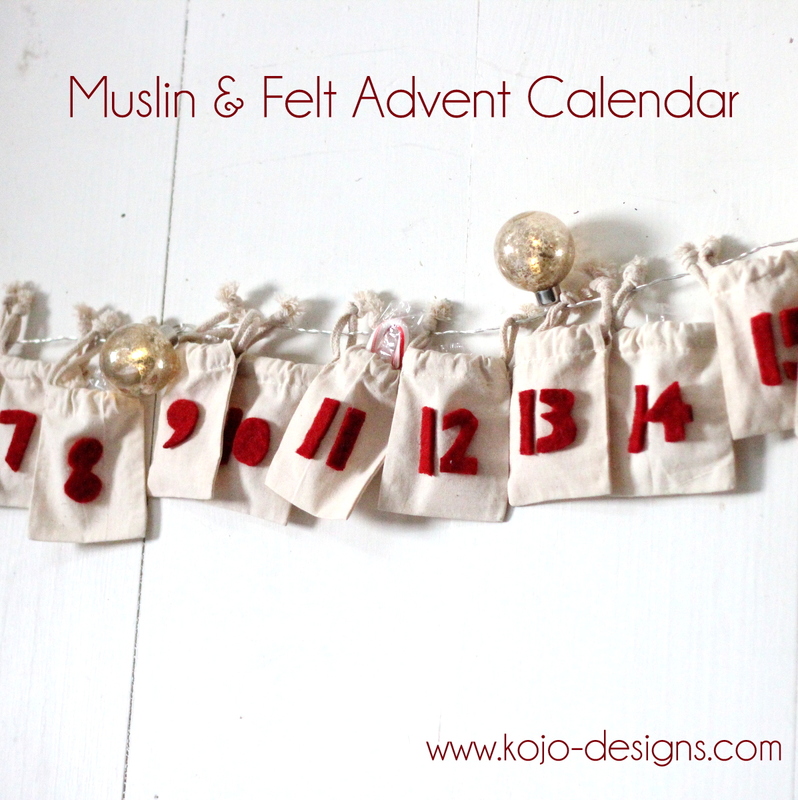 Do you have an advent calendar this year? How do you balance the fabulous, magical Christmas-y parts of this season with the tendency towards frenzy? 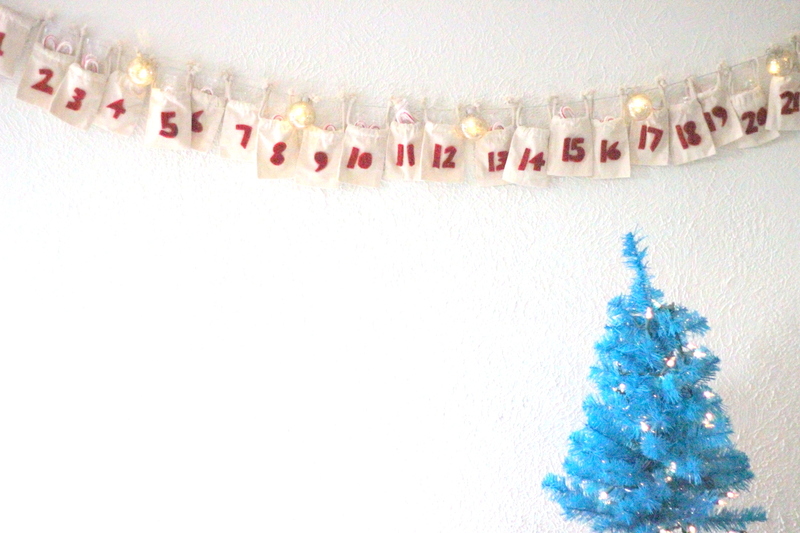 I have been meaning to make an advent calendar for 2+ years now and I just never seem to make it happen. We had such a beautiful one growing up……I’ll get around to it…….someday (hopefully before they are all grown up!). Yours is adorable ~ sometimes the simple things are the best!! ya…this does look pretty familiar 🙂 great minds! And I hear ya on having basically nothing for decor. Can I tell you what works beautifully in a white home with blank walls? Felt. I couldn’t use it in my old elegant/rustic living room without it looking a bit clownish, but we are currently rocking a felt circle garland and a felt tree in the living room, and they are both just so festive and bright and fun. 🙂 Both of my kids decorate and re-decorate the felt tree, and since I picked the colors and decorations for the tree it’s happiness for mom’s eyes as well. Love the felt, friend. I bet it’s so happy and cheerful! 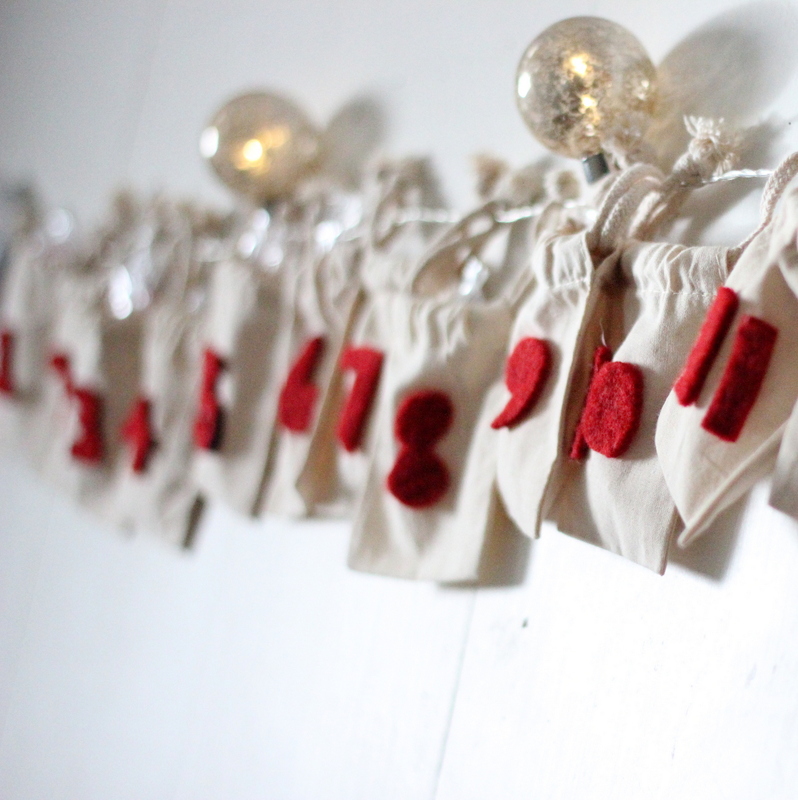 And I love all of your advent pinning- I’ve repinned a bunch of your ideas I think. And oranges and cinnamon ornaments? I bet your house smells so good!!! ps- Adam’s family always baked Jesus a birthday cake growing up- such a great idea, right? I love the simplicity of this. The muslin with the red is fabulous. Great list! Yeah…our first year doing an activity advent got way out of hand. We have since toned it down and love it again. Good job mama for keeping it fun and manageable!